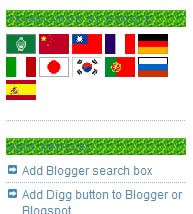 The sidebar usually has many different widgets, ranging from links to labels to advertisements. It is wise to make the Headers in the sidebar stand out from the contents. Navigation will be easier for the readers, and with a unique choice of colors, you can draw the attention of the readers to these widgets. Add the above background color code and Preview the template. Do not save. Because there are many different types of templates, you have to first confirm that this is where your sidebar header styles are situated. 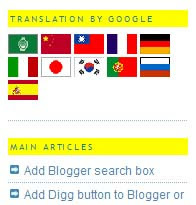 If you see the yellow backdrop to the sidebar Headers, you can then change the color to something that suits your Blog. For a list of color codes, you may refer to our Color Code Chart. If you don't see the yellow color, you can try inserting the color code under h3 or h4. To add a background image, first create the image. After that, upload the image to a free server. You can read about using free hosts like Google Page Creator and Google Groups. We also have a rather comprehensive list of free Image Hosts and File Hosting Services in our article on Manage Blogger Image Storage Space. Check out those sites and choose one that is fast, reliable and enables hotlinking to the uploaded files. Take note of the picture URL. Take note of the Image URL. See that when you enter this Image URL into your browser, you are able to view the image, instead of being prompted to download it. Now, replace the part in purple with the URL of the image that you have created. The sidebar Headers will have this image as a background. There are further attributes on positioning, repeating the image, etc. which can be included. If you are interested, you can adopt the attributes discussed in our Background Image for Blogger Template article. Here, what we have done is to fix the background color of the Date header as white to be consistent with the background color of our Blog Posts. Change the color code to your Blog Posts background. Preview and save the template. Alas the background colour to sidebar titles looks awful. Yours looks better. Can you give us instructions on how to underline the sidebar titles instead? Thanks. Relative to this one it works ok, but, in my case using the K2 template (I don't know if it is related to the specific template) it only give background color exactly the same width that the title word/sentence just like a highlight effect. How can I use a background color with the exact width of the sidebar and not restricted to the width of the sidebar titles? it simply doesn't work. I tried to paste your line with the background url in my h2 style block (modify html) but it returns to me an error code: bX-qarjrd. the link and the image are ok.
Seen this on some blogs but haven't figured out how to place a different image for each wedget title. Thanks, and your blog rocks!! You give some awesome help! With Widgets you have that title line at the top when you create them. If you don't want a title to show up on the main blog portion (you leave blank) you get a generic title on your add or arrange screen like, "html java' meaning you added some html or java to that widget, but didnt' place a title on it. Is there a way to place the title ONLY on the layout page, and NOT on the main blog portion? How do you add a border around the sidebar title? Anyways, I love your site. how about if i want to put different sidebar header images for each one? I added a background and border to the sidebar titles and and it works on all except the html and text gadgets. Do you have any suggestions how I can fix this? everything works just fine with only adding a background color following your instructions, but nothing happens when i try to use a background image?!? Has anyone an idea what the problem here could be? great tip. any suggestions as to how i can not have the image repeat? i've tried standard html, no workie..
My sidebar moved down, in line with blogpost. Please help I tried everything and checked around 100 blogposts for error tags.